Pinnacle Records spared no expenses when they released this single on 12" vinyl in five different clear-coloured versions: blue, yellow, red, green and brown. Targeteted for the large following of the then already cult brittish sci-fi TV-series Dr. Who, which in 1978 starred the curly-haired Tom Baker as the fourth doctor, the Ron Grainer-penned theme was of course remade in the style most popular at that time, disco. 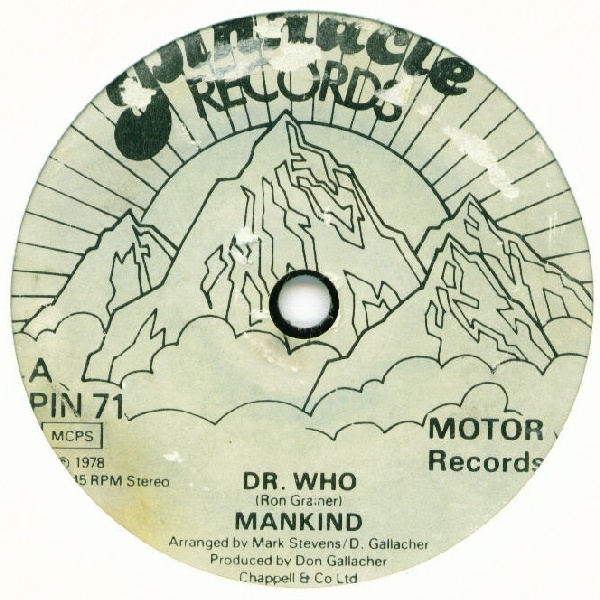 While the original in itself was a breakthrough for electronic music and the pride of the BBC Radiophonic Workshop with its instantly recognizable synthesizer sequences and eerie soundscape, arranged and played by the pioneering Delia Derbyshire, this would have been perceived as weak in comparison and as a purely commercial venture. But the skillfull blend of funky disco instrumentation together with electronics works wonderfully and simply proves that 1978 was a great year for disco. It could easily have been taken to a higher level of cheesy-ness, but instead there is a heavy disco beat and funky baseline nailing it to the floor and even some nice breaks where this proves to be a very humorous take. A dedicated passion for the plastic and paper that conjure the dream of cosmic analogue cheesy discoteques: The Disco Academy is one half blog, one half guerrila record store. You can find our permanent crate at the Rundgång Record Store in Malmö, Sweden (on Kristianstadsgatan 14). The Academy is run by Sergio Rizzolo. I'm also a part of the music collective Prejka.